1 » A pair of former Florida Gators were signed by NFL franchises on Wednesday. After spending the first 11 weeks of the season out of the league due to the Pittsburgh Steelers cutting him following an offseason arrest, running back Chris Rainey was picked up by the Indianapolis Colts and is expected to contribute as a returner. Linebacker Jermaine Cunningham has bounced around the league this year. After being cut by the New England Patriots during the preseason, Cunningham was picked up by the San Francisco 49ers but never activated and released in about a month. The New York Jets have since decided to add him to their roster and see if he can provide some depth as the team hopes to make a run at the playoffs. 2 » The two Gators in the NBA arguably having the best seasons so far are a couple of the youngest players to have entered the league. Houston Rockets forward Chandler Parsons began turning heads last year but has continued his stellar play in 2013-14 with 20 or more points in six of 12 games with two of those efforts resulting in double-doubles. His latest top-notch effort came Wednesday when he posted 21 points, 11 rebounds, five assists and four steals in a loss at Dallas. Parsons was 7-of-10 from the field and 4-for-5 from downtown. Perhaps more impressively, second-year guard Bradley Beal has registered 19 or more points in seven of 11 games (including four-straight) with the Washington Wizards. On Wednesday, he notched 26 points, eight dimes and seven boards, going 6-for-7 from three to lead Washington over Cleveland. Check out two more BITS of Gators news…after the break! Later in the day, the City Hall in Jersey City, NJ had to be cleared out due to an anthrax scare. 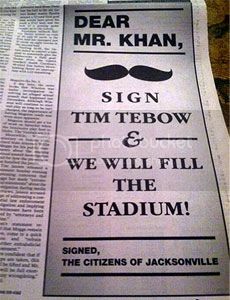 How does that relate to Tebow? Someone sent a letter to Mayor Steven Fulop that contained white powder and a picture of Tebow. A source told The Jersey Journal that the “letter contained ‘spiritual stuff. Heaven stuff. A picture of Tebow.’” The white powder wound up not being poisonous. On Tuesday, while discussing a controversial call made at the conclusion of Monday Night Football, former NFL supervisor of officials gave a backhand slap to Tebow when discussing how referees determine whether a pass is uncatchable. “We as officials have always been taught, for a ball to be uncatchable, it has to be clearly out of the field of play or it has to be kind of – I probably shouldn’t say this – a Tim Tebow-type pass that lands 15 yards in front of you,” he told USA Today. 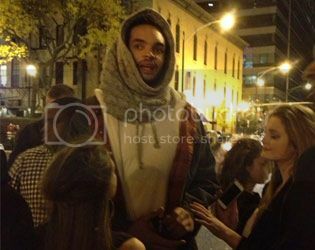 4 » Chicago Bulls center Joakim Noah recently wore this out in public (see below, h/t Deadspin.com). In other news, Noah has started relatively slow this season as he works his way back from last year, one in which he was plagued by injuries. Noah is averaging just 8.8 points and 8.9 rebounds per game depsite playing 30.3 minutes on average through his first nine games. If those averages last through the season, they would be his lowest since his sophomore season in 2008-09. 5 » Former Gators and Miami Dolphins linebacker Channing Crowder, now retired, admits that he peed on himself during every game he played. “I never went to the bathroom – in a toilet. Six years straight I peed down my leg,” he said. This admission was made to NFL Films, which was piecing together a segment on random trivia and facts about NFL players. 6 » Nearly every time a video of forward Corey Brewer appears here, it is of him making an amazing play, usually a clutch three-pointer or fastbreak tomahawk dunk. This time, it’s the opposite. Now back with the Minnesota Timberwolves, Brewer got his ankles broken in a major way last week by Los Angeles Clippers point guard Chris Paul. First check out the play, then Brewer’s reaction. This is an impartial ref who probably, came from the SEC where he was always one of the refs assigned to Gator games to make sure our opponents were never penalized for holding at the line of scrimmage. This was very important when we played Alabama to keep Coach Saban from taking “his team” and leaving the SEC to become an independant like Notre Dame. If you have to preface what you are going to say with “I probably shouldn’t say this” then you shouldn’t be saying it. Guy was a UK grad and an SEC official from 1978-1988. Brewer was my favorite player off that team. He played relentless D and always seemed to hit the big shot. Miss him playing in a Gators uni! !